Hayley Young. 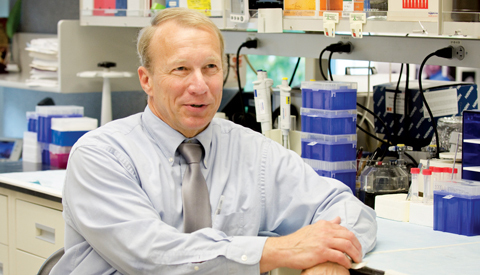 PICTURED: Fred Hutchinson Cancer Research Center Acting SVP Oliver Press. For Fred Hutch researcher Dr. Oliver Press, academic medical research is all about sharing and collaborating. “If enough people work together on a problem,” he asserts, “we can conquer it.” Press is among the many Fred Hutch scientists and humanitarians working to prevent, diagnose and treat cancer, HIV/AIDS and other deadly diseases. He conducted the first clinical trial demonstrating the efficacy of treating B-cell lymphomas with targeted monoclonal antibodies. His research was influential in the development of rituximab, a medication used to treat autoimmune diseases and certain types of cancer. Motivated by the great strides being made in cancer research today, Press says, “We are all standing on the shoulders of giants so that every stride creates an opportunity for someone else to take the next step.” During his career, he has seen the cure rate for Hodgkin lymphoma rise from 10 percent to 90 percent because of advancements promulgated by the international cancer research community. Press believes the most promising area of research right now is immunotherapy — harnessing the body’s own immune system to fight cancer. “The idea of using our own immunity rather than toxic chemotherapies is a huge stride,” he says. One of the best parts of his job is keeping in touch with some of his success-story patients. “The one experience that always thrills me is receiving our annual Christmas card from a patient I treated 25 years ago,” he relates. The woman underwent a then-experimental, now FDA-approved, treatment for a cancer that kept recurring. “Every year,” Press notes, “she sends us a picture of her and her husband in some fun setting: in the hot tub, in Mexico or with their many grandchildren.” Recognized for both his scholarship and his deft advising of others, Press received in 2015 the inaugural Research Visionary Champion Award from the Leukemia & Lymphoma Society, Washington/Alaska Chapter, and in 2016 the UW Department of Medicine Mentorship Award. Dr. Jane Buckner is a scientist internationally recognized for pioneering research in autoimmune disease and for translating the findings in her laboratory to the clinic. Her driving vision is to turn the tide against autoimmune diseases so that, beyond treating or trying to contain them, science prevents them from ever taking hold. Buckner is a leader in the medical research community because of her career-long dedication to mentorship and her commitment to educational outreach. Benaroya Research Institute at Virginia Mason is one of the world’s top biomedical research institutes in the field of autoimmune diseases, with 275 employees, including 24 faculty members and an annual budget of $70 million.